Get a professional advice from anywhere, from any device. Both In-Clinic & Virtual Appointments Available Now! Virtual Consultation* – get professional advice from anywhere, from any device. In-Clinic Consultation – sit face-to-face with our experts. We offer BEST Prices in GTA. Special Discount available to Students, Seniors, and Groups (3 or more people). We are a team of highly dedicated, expert health care professionals specializing in Travel Medicine. We will only recommend the necessary vaccines. Please call or book online and we will try our best to accommodate your schedule and provide you with an appointment that works for you. We have been approved by the Public Health Agency of Canada to provide Yellow Fever Vaccination to any travelers who may require the vaccine. 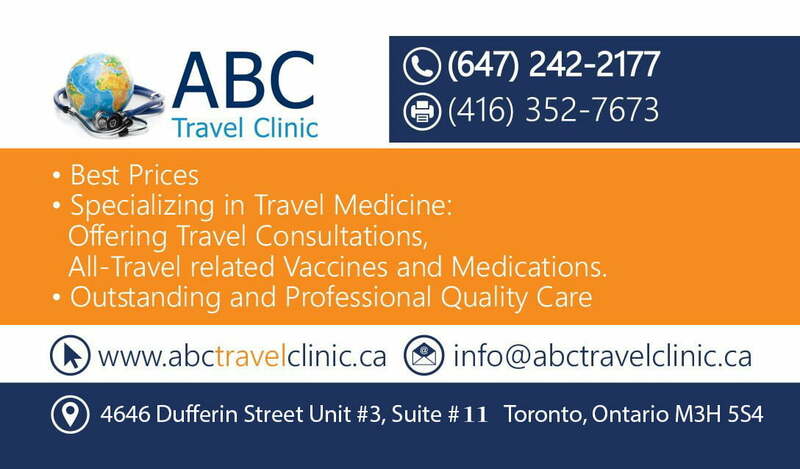 Located in Markham, ABC Travel Clinic is staffed by expert health care practitioners specializing in the Travel Vaccines, Medications & professional advice. We offer extensive travel medicine consultation including administration of appropriate needed vaccines and medications for your travel destination and providing you with the latest health updates. Our staff is fully trained and licensed, and fully professional, with years of experience in travel medicine. For more information about us, please read here. We have customers visit us from all over the Greater Toronto Area & York Region, and we encourage you to consult with us about your travel plans. Book your appointment with us. Immunizations: for a complete list of the immunizations we offer, see our vaccine list. Travel medicine reports, updated for every country. Advice on medical and communicable disease concerns. Insect-borne diseases such as Malaria, Dengue Fever, Zika, Yellow Fever, Japanese Encephalitis, and many others. Medical concerns such as preventing Altitude Sickness, Traveler’s Diarrhea, Schistosomiasis, and any other concerns that you may have related to your travel. Travel advice for those traveling with children, elderly people, those with compromised immune systems, pregnant women and solo travelers. A consultation generally takes an hour of your time and unfortunately, Travel Medicine is not covered by OHIP. The cost of a consultation will vary depending on the location, vaccines, and risk. Extended health insurance providers may reimburse costs. Many of our immunizations are covered by your extended health insurance. For a complete list of vaccinations and medications that we offer, please refer to our Drug Identification Numbers, see here. ABC Travel Clinic is a designated Yellow Fever Prevention Clinic. We offer International Yellow Fever Certificates for countries that require vaccination for entry. We stock a variety of disease prevention accessories. Be sure to stop by our clinic to purchase your necessary travel accessories. Our Office Hours: By appointment only, we are located just north of Yonge Street & Steeles intersection @ Shops On Yonge, Markham. Please call or book online for your personalized travel consultation. I've been to other clinics before and this is one I will be returning to. Anna was very patient at helping me understand all the potential risks at my destinations and I never felt rushed. Despite her likely being patient with everyone, I've got my appointments on time with virtually no wait time in the waiting room, so great time management! She was also very responsive in our e-mail correspondences and accommodated my busy schedule to ensure I could get what I needed prior to my short departure date. I was amazed how simple, easy, and professional it was from booking an appointment to getting an outstanding travel care service. I was able to get a same day appointment and the receptionist Maria was able to squeeze me in last minute. The prices are awesome compared to other travel clinics as I was calling around and asking information. Maria took the time to explain to me everything over the phone without pushing me to book an appointment. I came in to the clinic and was greeted by Candace who is a Registered Nurse working at the clinic. She took the time to explain everything I needed to know for my trip without pushing or trying to sell extra vaccines for my trip. Amazing customer service and would recommend this clinic to everyone who is traveling!